Get ting SAVI About GIS Pratt’s nascent visualization initiative is providing important tools on campus and in the community beyond. Breathing Life into Numbers With big data increasing and attention spans shrinking, infographic designers are the new storytellers du jour. 44	Celebrating 20 Years	Since becoming President of Pratt in 1993, Thomas F. Schutte has transformed the Institute—and the local community. a bo u t the c ov er Adriana Lima, Vogue Brasil n303, from Digital Beauty, 2008 by Naroa Lizar (M.F.A. Integrated Practices and New Forms ’13) Digital Beauty examines the influence that the media, post-production techniques, and digital manipulation have on Western societies’ obsession with perfection and beauty. Lizar began with magazine covers featuring the five most desirable women of 2007, as determined by an AskMen.com survey, and altered the digital images’ code by inserting into it information on digital manipulation from a Photoshop manual. Social @ Pratt Via our social media sites, we asked people in the Pratt community what they think of the tools and trends discussed in this issue. Here’s what they said. Q. Augmented reality is a live view of a real-world environment whose elements are enhanced by computer-generated sensory input such as sound, video, graphics, or GPS data. Does your work incorporate augmented reality? Q. Has technology changed the art world for better or for worse? Q. How have infographics impacted design and society? Got something to add? 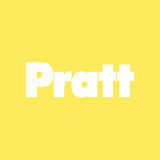 Share your thoughts by following Pratt on Twitter @PrattInstitute, liking us on Facebook at Facebook.com/PrattInstitute, or by emailing prattfolio@pratt.edu. Pratt is home to a distinctly visual community. As one of the world’s leading art and design colleges, the Institute gives students in every discipline the opportunity to learn the very immediate and universal language of imagery. At the same time, our students, faculty, and alumni live in a world increasingly focused on information and data. 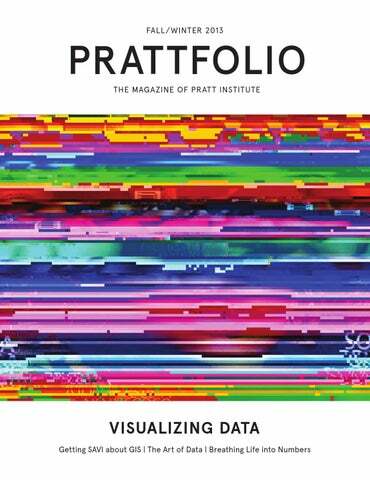 This issue of Prattfolio examines some of the ways Pratt artists and designers are using their skills to transform cold statistics into meaningful stories—and, in turn, how data itself is inspiring new creative works. One of our students’ greatest sources of inspiration is the Pratt campus itself, which is known across the country for its architecture, sculpture park, and exquisitely landscaped grounds. We continue to enhance the campus environment and, this fall, dedicated the Engineering Quadrangle, which was completely redesigned thanks to the generosity of Pratt Trustee Emeritus and alumnus Bruce M. Newman (B.F.A. Interior Design ’53). The ribbon-cutting for this beautiful new outdoor area was a highlight of Alumni Day 2013, which brought more than 600 alumni back to campus for a full day of presentations, performances, and receptions as well as our second annual Alumni Art & Design Fair. Plans are already underway for next year’s Alumni Day on Saturday, September 20, 2014, so mark your calendars. The entire Pratt community is eagerly anticipating the reopening of Main Building next spring in addition to the opening of the new state-of-the-art Film/Video facility on Myrtle Avenue, which will support the department’s new curriculum emphasizing video as an essential communications tool. As you can see, it’s an exciting time for the Institute and for our alumni across the country and around the world. I hope you enjoy this issue of Prattfolio and share my sense of pride in the work that your fellow alumni, as well as our faculty and students, are doing. Please submit address changes to alumni@pratt.edu or call 718.399.4447. The editorial staff of Prattfolio would like to hear from you. Please send comments, ideas, questions, and thoughts on the redesign to prattfolio@pratt.edu. Unfortunately, we cannot publish all unsolicited submissions, but we consider all ideas and greatly appreciate your feedback. Dubbed “the theatre poster legend” by Playbill, Frank “Fraver” Verlizzo has created the artwork for more than 300 Broadway and Off Broadway productions, including Sunday in the Park with George, Sweeney Todd, and Our Town. In 1987, he received a special Drama Desk Award for his “inspired artwork for theatrical productions,” an honor never before bestowed in this realm. Among Fraver’s most famous works worldwide is the poster image for The Lion King, which he designed for Disney Theatricals in 1997 when he was vice president/creative director at Grey Entertainment. Unlike many shows for which Fraver had previously developed artwork, The Lion King was already a successful animated film. It was up to Fraver to create a compelling image that captured the stage production’s unique look. Prattfolio talked to Fraver about the design process. What inspired your design for The Lion King artwork? I recalled the cave painting image of Simba from seeing the movie years before, and the Broadwayshow design was heavily stylized based on African art. Disney supplied us with many of Julie Taymor’s costume sketches and Richard Hudson’s set design sketches to use as references. The graphic nature of the border patterns on the fabric specifically had a huge influence on me. What challenges did you face designing the poster? The mane presented a challenge. There were so many ways to treat and interpret it. I eventually drew by hand at least 50 other Simba head sketches until I was seeing them in my sleep. Producer Thomas Schumacher then had legendary Disney animator Hans Bacher distill my designs into what became the woodcut-like icon. What made the poster design distinctive? Its simplicity and use of solid black, red, and yellow. The Disney producers were drawn to it right away. As a result, the bold-type design (based on a Neuland font) never changed and the bright taxicab-yellow background remained as I first presented it. Opposite page: The Lion King, 1997, poster art. Verlizzo created this bold graphic treatment for the poster of the Broadway musical The Lion King based on the Disney animated film of the same name. Above left: Pai at his 1907 Steinway grand piano; Above right: The cello Pai received as a 70th birthday gift, with a model of Notes from the Stars; Opposite page: The Pais’ sitting room. Measles genotype map by SAVI team member and Graduate City and Regional Planning student Sadra Shahab for the Measles and Rubella Initiative, a partnership led by the American Red Cross, the United Nations Foundation, the U.S. Centers for Disease Control and Prevention, UNICEF, and the World Health Organization. it easier for communities to interpret and use them as policy, planning, and decision-making tools. “At the end of the day, visual representation is as important as the quality of data analysis,” Braden observes. “Our vision for SAVI is to produce outstanding multidisciplinary projects with the highest-caliber visual display— making the invisible visible, both inside and outside Pratt’s gates.” John Shapiro, chair of GCPE, which is part of the Institute’s Programs for Sustainable Planning and Development (PSPD), says, “When I was a planner starting out in my career, GIS was a very expensive tool, and what you got was basically a computer-generated map. It’s grown up to be a whole other phenomenon.” As a partnership between PSPD, the Pratt Center, and the Graduate Communications Design Department, and overseen by the Office of the Provost, SAVI promises to show Shapiro and all of us where GIS is heading. GIS in Its Prime Long before computers generated maps, GIS existed in principle. In the first half of the 19th century, epidemiologistgeographers Charles Picquet and John Snow used a layered-mapping technique to portray cholera outbreaks in Paris and London. In the 1960s, the Canada Geographic Information System used technology to map the soil, land use, and animal species of rural Canada. Several years later, Harvard University’s Graduate School of Design formed the Laboratory for Computer Graphics and Spatial Analysis, which would remain the hotbed of GIS innovation for the next two decades. GIS has since grown more democratic due to cheaper tech platforms and greater availability of data via public agencies and social media. “There’s a combination of the data opening up, increasing Internet speeds for easier data transfer, and access to open-source tools to work that data,” Braden explains. SAVI provided technical assistance to Pratt PSPD students Katy Donald and Humberto Martinez, and University of Pennsylvania landscape architecture student Emily Silber, who created this graphic as part of the RAMP Community Planning Studio. “We want to teach students how to ask the right data questions.” –Juan Camilo Osorio Both undertakings were cited in Braden and Osorio’s 2012 report, as part of a series of case studies showing what Pratt could accomplish by centralizing its socially-conscious GIS expertise. Under SAVI’s banner, students could find mentorship while professors shared best practices, researchers advertised for collaborators, and community activists sought the power of geospatial knowledge. The report revealed an even more compelling reason to launch SAVI: there was no known college- or university-level GIS lab with a mission to serve academia and citizenry simultaneously. first completed with data from 2000, and SAVI’s updates will help the Pratt Center and its partners understand how transportation access has changed over time as well as current challenges for low-income workers. The Pratt Center is a natural partner for SAVI as “the nation’s original college-based technical assistance provider to community groups,” as Braden puts it. correctly, and presenting it in the right way to tell a meaningful story,” she says. Whether it is assisting communities or championing best practices, SAVI is charting a course for the GIS field, particularly in terms of standards for graphic and interface design, two of Pratt’s strengths. The partnership with the Graduate Communications Design Department “will allow exposure for students and faculty to the GIS process, provide access to data for research purposes, and aid SAVI by providing visualization and design expertise,” says Jeffrey Bellantoni, chair of the Graduate Communications Design Department. For example, this fall SAVI graduate assistant Jenn Boggs is evaluating students’ GIS visualizations and producing a cartography manual with Braden. In addition, SAVI will develop its own GIS products. One under way is UrbanNexus, which will track current and historical planning efforts and data creation by neighborhood, then weave the information into a single citywide map so that residents can discover and comment on every plan ever schemed for a neighborhood. The result could revolutionize planning in New York and elsewhere. As Osorio notes, “Considering that we embrace so many disciplines, we are uniquely positioned to frame that conversation.” Thanks to SAVI, Pratt can expect many more groundbreaking conversations to come. For Pratt artists who operate on the frontiers of technology, electronic data is more than just an exciting source of new artistic material. conservator for the Museum of Modern Art. “It’s all over the place. But data alone is not enough. The artist has to expose something deeper, whether it is a human story or a bias in the data, to make it art.” At Pratt, two graduate programs within the School of Art and Design are at the forefront of this creative inquiry. Both the Integrated Practices and New Forms M.F.A. within the Department of Fine Arts and the Interactive Arts M.F.A. within the Department of Digital Arts provide opportunities for artists to develop sophisticated visual statements from myriad data resources. And as the technologies advance for capturing, manipulating, and analyzing data, Pratt artists have responded by producing work of increasing complexity and beauty. Crossing Boundaries Integrated Practices and New Forms is an interdisciplinary degree that allows students to explore both traditional studio practices and newer forms of creative expression. While some artists enter the program with a background in digital artmaking, for others, it is the emphasis on crossing boundaries and exploring new fields of knowledge that inspires them to incorporate data into their creative practice. We’re living in a world that prizes accountability, testing, and research-driven conclusions. But mathematical figures alone don’t always produce answers. That’s where today’s data visualization wizards are stepping in to help break down big data and difficult concepts. “Infographics have always been a part of design education,” says Jeff Bellantoni, chair of the Graduate Communications Design Department. “What has changed is the amount and accessibility of data that requires visualization. The proliferation of data has increased the demand for graphic designers to make sense of it, establish hierarchy and improve access to and communication of the data.” Graphics that can be “read” quickly are the natural outcome of a digital culture where audiences are inundated with information and brevity is prized. One byproduct of this infographic trend, prompted by the digital realm, is that those who have always been visual thinkers—many at Pratt—are finally being presented with media that resonates with their learning style in real-life settings like the classroom. And as these three stories prove, Pratt designers are at the vanguard of innovation with this evolving communication tool. There are several popular models for understanding game theory, including one called “Prisoner’s Dilemma,” which examines the different outcomes between two prisoners who have committed the same crime, have been placed in solitary confinement, and have the option to confess or stay quiet. The implications—with jail time, freedom, and other punishments at stake—vary depending on who admits to committing the crime. The model has a broad array of implications for the natural world as well. “If you get a resource by exploiting the kindness of another individual, that selfish personality type would win out against those who are naturally more cooperative,” says Jensen. But that kind of widespread behavior can be harmful for everyone involved. “Any time there’s a common resource— even though it makes sense to preserve the resource—the temptation to look out for yourself causes everyone to overuse it and it collapses.” In other words: cooperation is often the key to survival. Teaching evolutionary biology and ecology to art and design students at Pratt, Chris Jensen knows that his students often learn best through interactive and visual stimuli. When he couldn’t find the perfect teaching tools, he decided to create them himself. To illustrate these models, Jensen looked no further than the Pratt campus. Thanks to Pratt’s graduate assistantship program, he hired then students Jean Ho Chu (M.F.A. Digital Arts ’11) and Greg Riestenberg (M.F.A. Communications Design ’13). In particular, Jensen wanted to produce a series of graphics related to game theory, the study of strategic thinking that examines the benefits of cooperation versus selfishness. Above and on opposite page: Graphics from Lauren Manning’s thesis project. Charting the Quantified Self A few years back, Lauren Manning (M.S. Communications Design ’11) became interested in tracking her every move. Each day, she recorded personal data points: what she ate, what she drank, where she spent time, movies she watched, emails she sent and received, what subways she took, etc. Manning was unknowingly part of the “quantified self ” movement—a term coined by two Wired magazine editors—in which people monitor their behavior over time by recording it. The data soon came in handy with her academic studies. For her thesis project at Pratt, Manning took all the food-related data and broke it down into 40 visualizations illustrating the location of her meals, the popularity of certain foods in her diet, her 2009 diet compared to her 2010 diet, and other topics. She even devoted full charts to her monthly ham consumption and French fry intake. The project not only clearly displayed her habits and preferences, it provided “the foundation for my knowledge about infographics,” says Manning. Today, she considers it a great educational tool—a sprawling array of design possibilities—for designers just starting out. “The ultimate audience is someone who’s doing data visualization for the first time,” says Manning. “If you’re coming across my project, you can see some of the pitfalls,” not to mention the final products culled from many hours studying data visualization. In particular, she voraciously read books by Edward Tufte, a statistician, professor emeritus at Yale University, and the “godfather of information graphics,” Manning says. She also studied work by graphic designer, architect, and TED conference founder Richard Saul Wurman, who is also known for his innovative approaches to creating simple visuals out of complex information. The project also helped Manning land her first job, at ad agency R/GA, after graduating from Pratt. Websites following the design world like Fast Company, Visual News, and Infosthetics featured the project. R/GA saw her work and contacted her to become part of their new data visualization team. (She recently left R/GA to work for Code and Theory, an interactive design agency.) Two years after graduating from Pratt, Manning looks back on the project as a seminal experience. “That exploration process was the best creative process for me,” she says. Manning was inspired by the “quantified self” movement—the term was coined by two Wired magazine editors—in which people monitor their behavior over time by constantly recording it. Graphics produced by Radhika Unnikrishnan (M.S. Communications Design ’12) for one of Hyperakt’s corporate and philanthropic clients. Amendment by visualizing the key components of its historic development on both quantitative and qualitative levels. The project’s interactive website features a timeline of seminal Supreme Court cases involving the First Amendment; a case browser that allows legal researchers to filter selected First Amendment cases by criteria such as specific keywords, rights asserted, or chief justice; statistical visualizations that use a Supreme Court database, which records over 60 variables on each case, to examine patterns and trends in the history of the Court; and a citation network that looks at the conceptual structure of the law by visualizing citations between Court opinions. “Data visualization is about trying to find hidden patterns.” — Chris Alen Sula The impetus for the project came about when students in Rabina’s information policy class began noticing discrepancies in the awarding, rescinding, and interpretation of First Amendment rights and began looking for commonalities. For example, in Olmstead vs. United States (1928), the court determined that wiretapping a person’s home without a warrant was not a violation of the Constitution. Forty years later in Katz vs.
United States (1967), the court ruled that wiretapping a phone booth outside of a suspected criminal’s home did violate First Amendment rights. Did the change in the Court’s ruling reflect a trend and, if so, what were the ramifications of this shift? When Sula, whose areas of expertise include information visualization and interactive technology, joined the SILS faculty in 2011, he and Rabina teamed up to use these techniques to help answer such questions and reveal deeper legislative trends surrounding the First Amendment. “Data visualization is about trying to find hidden patterns,” says Sula. By using digital tools to visualize legal content, Sula and Rabina aim to advance legal scholarship and increase public access to legal history. “The visual nature of this project allows users ranging from law experts to members of the public to engage with First Amendment data— searching for patterns, observing trends in legal interpretation, and developing a deeper understanding of constitutional freedoms. Visualizing the First Amendment is scheduled to launch this fall at visualfa.org. Sula anticipates that the methods and systems developed for the project will serve as a model for future visual legal scholarship. The First Amendment to the United States Constitution prohibits the making of any law respecting an establishment of religion, impeding the free exercise of religion, abridging the freedom of speech, infringing on the freedom of the press, interfering with the right to peaceably assemble or prohibiting the petitioning for a governmental redress of grievances. It was adopted on December 15, 1791, as one of the ten amendments that compose the Bill of Rights. Top: A visualization of Supreme Court cases involving First Amendment issues over the past 70 years; Bottom: A network visualization of citations among Supreme Court opinions relating to the First Amendment in schools. Conservative decisions are colored in red; liberal decisions in blue. Inspired by nature in all her designs, Schwartz took cues from the honeycomb pattern of beehives for the oxidized sterling-silver cuff and gold-plated stainless steel ring, both of which are manufactured using 3-D printing and lasercut technologies. Available at fab.com. T-shirt lovers Mehrotra and Ferris were tired of seeing T-shirts displayed in square frames incongruous with their true shape. So for a competition with design firm Umbra, they created a frame that preserves the T-shirt’s form, turning favorite graphic design tees, concert memorabilia, beloved sports jerseys, and the like into wall art. Available at umbra.com. Eva Zeisel: Life, Design, and Beauty Pirco Wolfframm, Adjunct Associate Professor, Undergraduate Communications Design $37.50 (Chronicle Books, 2013) The career of industrial designer and former Pratt faculty member Eva Zeisel (1906-2011) is celebrated in this hardcover book, which features extensive photographs of her work accompanied by short essays. As a ceramicist, Zeisel designed household wares inspired by the forms of nature and became the first female designer to have a solo exhibition at MoMA. Available at amazon.com. Destination PSP Collection Tom Dolle, Adjunct Professor, Graduate Communications Design $15-$45 Always a fan of mid-century Modernism, Dolle adores the bright colors and 1950s-70s architecture of Palm Springs, the Californian desert oasis. A frequent visitor, Dolle recently designed Destination PSP, a Palm Springs-inspired collection of mugs, T-shirts, towels, and sturdy melamine tableware, perfect for poolside dining and revelry. Macy’s carries the melamine tableware, and the line is also sold in the Palm Springs Visitors Center. Available online at destinationpsp.com. Banks salutes American sportswear designer Perry Ellis in this hardcover monograph featuring a foreword by designer Marc Jacobs. Photographs and sketches illuminate each season of Ellis’s career, which spanned 1976-86, during which time his chic, loose-but-tailored style delighted aficionados of womenswear and menswear alike. Available at amazon.com. Katherine Robinson, M.S. Communications Design ’13 $10.95 The Why, What, Where Embossed Teal Journal is one piece from the latest series of back-to-school products created by Pratt students as part of the Institute’s ongoing collaboration with Barnes & Noble that was launched in 2009. Available at barnesandnoble.com. If famed mid-century designers Ray and Charles Eames had lived during the iPhone era, what kind of cases would they have designed? Pruden channeled the duo and other contemporaries to create the unique piece, which features a carved walnut veneer. He submitted his idea to a 24-hour, crowdsourced accessory-design competition and won. Available at quirky.com. Pratt’s latest campus beautification project, the redesign of the Engineering Quadrangle, was a collaborative effort by Trustee Emeritus Bruce M. Newman (B.F.A. Interior Design ’53), recent architectural graduates from Pratt and CUNY, and the Office of Facilities Management. The Quadrangle, bounded by the Chemistry, Machinery, and Engineering Buildings, was reconstructed to allow for better circulation and enhanced aesthetics, and to reinforce the design cohesiveness of the campus. New bicycle racks were also installed alongside the Chemistry Building. Pratt’s Office of Planning, Design, Construction, and Facilities Management has been working on the Main Building rebuilding efforts and, as part of the renovations, the landmark building will feature a green roof. The Institute has retained Helpern Architects, which has significant experience with historic buildings, restoration, and sustainable design. Over the past several months, fire-damaged and water-damaged materials were removed, interior walls were reinforced, and temporary waterproofing was installed. A sidewalk bridge has been installed in the courtyard to enable access between the Newman Mall, East Building, and the Gallery Café. Re-occupancy of Main Building will begin in phases by floor in early 2014. Alumni Day 2013 Draws Record Number Back to Campus More than 600 Pratt alumni returned to campus on September 28 for Alumni Day 2013. The daylong event included Pratt’s second annual Alumni Art & Design Fair, gallery exhibitions, an academic fair, campus tours, and an evening cocktail celebration. There were also special events for engineering and international alumni as well as those celebrating their 10th, 25th, 35th, 40th, and 50th+ reunions. Other highlights of the day were the Engineering Quadrangle dedication ceremony honoring Pratt alumnus and Trustee Emeritus Bruce M. Newman (B.F.A. Interior Design ’53) and a Creative Conversation between Pratt professor Tracie Morris and Motown singer-songwriter Valerie Simpson, who co-wrote such hits as “Ain’t No Mountain High Enough” and “You’re All I Need to Get By.” The festivities concluded with an outdoor concert featuring Madame Pat Tandy and her trio, an alumni cocktail reception, and reunion class parties in local pubs. Pratt Launches Young Scholars Program for High School Students The Department of Art and Design Education and a team of faculty and staff from across the Institute have launched the Pratt Young Scholars program, developed with the support of the Pratt Institute Innovation Fund Award 2013. This four-year scholarship program will provide New York City high school students with access to year-round studio classes, workshops, field trips, and lectures at the Institute. The Pratt Institute Innovation Fund, a strategic partnership between the Office of the Provost and Institutional Advancement, provides seed grants of $20,000 for compelling projects and initiatives conceived by faculty and staff. Architecture Professor Gia Wolff Wins 2013 Wheelwright Prize Gia Wolff, professor of undergraduate architecture, won the 2013 Wheelwright Prize. The prize, a $100,000 traveling fellowship from the Harvard University Graduate School of Design, was awarded to Wolff for her proposal to study the design of parade floats around the world. Her project, entitled “Floating City: The Community-Based Architecture of Parade Floats,” was chosen from more than 200 proposals submitted around the globe. Maria Damon Appointed Humanities and Media Studies Chair Maria Damon has been appointed chair of the School of Liberal Arts and Sciences’ Humanities and Media Studies Department. With more than 25 years’ experience in higher education, Damon also has an extensive background as a published author and poet, artist, and scholar. As chair, she will oversee the department’s B.F.A. program in Writing and new master’s programs in Writing and Media Studies along with a variety of elective courses for non-majors. Pratt Professor of Architecture Theoharis David (B.Arch. ’61) was honored with the Institute’s Distinguished Teacher Award for 2013-14. This award recognizes exceptional dedication to Pratt’s mission and the recipient’s career accomplishments. David was the former chair of the Graduate Architecture Department and faculty president of the School of Architecture. His work as an architect and educator is continually published and exhibited worldwide. Rendering of the North Hall Green Roof by Pratt Urban Environmental Systems Management Summer 2012 Green Infrastructure Design & Build Studio students Michael Catalano, Catalina Parra, and Shane McCabe. City and Regional Planning student Natalie Vichnevsky explains her work in the green infrastructure course to Red Hook community members. This summer, Ron Shiffman, professor, Graduate Center for Planning and the Environment, and Deborah Gans, professor, Undergraduate Architecture, initiated RAMP (Recovery, Adaptation, Mitigation, and Planning), an interdisciplinary program that is teaching the next generation of architects and urban planners to tackle the social, economic, and environmental problems posed by climate change as they work alongside local community groups. RAMP kicked off in May 2013 in the Hurricane Sandy-ravaged Brooklyn neighborhood of Red Hook, where students—led by a team of Pratt faculty members—focused on creating housing, green infrastructure, and community-planning solutions. In fall 2013, RAMP studios are envisioning the future of New York City’s Coney Island neighborhood and plan to focus their work in the Rockaways this spring. The initial success of the program helped the team secure a Kresge Foundation grant of $120,000. Twelve students from Pratt’s Graduate Industrial Design program traveled to the small mountain town of Malinalco, Mexico, to collaborate with master woodcarvers, weavers, and welders on furniture, lighting, and other products over a two-week period last summer. The project was organized by Adjunct Professor Rebecca Welz and Ellen Calmus of The Corner Project, a nonprofit that works to aid families of migrant workers. Welz organized a similar collaborative project between Industrial Design students and artisans in Guyana in 2009. The student projects were on display in Pratt Studios in September. Recent drawing and painting graduates, all of whom were affected to various degrees by the fire in Main Building earlier this year, exhibited new work this summer in Effigy, an exhibition at The Painting Center in Manhattan. Curated by Visiting Assistant Professor Mona Brody, the show featured work by 22 artists and was made possible in part through the fundraising efforts of recent Fine Arts graduate and Effigy artist Juliet Knuth (B.F.A. Painting ’13). Additional support was provided by the Institute and The Painting Center. Ellsworth Kelly, a renowned painter, sculptor, and printmaker who attended Pratt from 1941 to 1943, received one of 12 National Medal of Arts awards from President Barack Obama in July. The National Medal of Arts is the highest U.S. government award given to artists. Kelly was selected for his role in shaping more than a half-century of abstract art and remaining a vital influence in American art. He was honored alongside opera singer Renée Fleming, playwright Tony Kushner, and filmmaker George Lucas. Pratt Launches Brooklyn Fashion and Design Accelerator Pratt recently launched the Brooklyn Fashion and Design Accelerator, a new Institute initiative that will help aspiring design entrepreneurs start new businesses and provide them with small-run production facilities in New York City. Located in South Williamsburg, the Accelerator serves as an expansion of the Pratt Design Incubator for Sustainable Innovation and will offer fully outfitted design studios and microfinancing resources for 30 start-ups. Initial funding for the Accelerator was provided by the State of New York, the Office of Brooklyn Borough President Marty Markowitz, and Pratt. New York City Council Member Brad Lander (M.S. City and Regional Planning ’98), former director of the Pratt Center for Community Development, received a Champions of Change award from the White House in July for his work on participatory budgeting. He was one of the first council members to bring the initiative to his district and give residents the power to decide which projects to support with their tax dollars. Lander, who represents Brooklyn’s 39th District, was one of 14 honorees nationwide to receive the award, which recognizes extraordinary Americans working to improve their communities through technology, innovation, and civic participation. Recent Graduates Participate in Prestigious Jewelry Show Samantha Nania and Jenna Pierson (both B.F.A. Jewelry ’13), two recent graduates from the Institute’s acclaimed studio jewelry program, sold their work alongside 50 emerging and celebrated jewelry designers from around the world at LOOT: MAD About Jewelry 2013. The annual juried sale and exhibition at the Museum of Arts and Design—the only American museum with a gallery dedicated to contemporary and modern studio and art jewelry— showcased one-of-a-kind artist-made jewelry and offered the public the rare opportunity to acquire pieces directly from the innovative jewelry artists. Black Alumni of Pratt Celebrates Creative Spirit Benefit Gala On September 12, the Black Alumni of Pratt recognized four remarkable women at its 23rd annual scholarship benefit gala, Celebration of the Creative Spirit. Lori Stokes, co-anchor, WABCTV’s Eyewitness News, hosted the glamorous gala, which was held in The Allen Room at Jazz at Lincoln Center. Renowned artist and former Pratt Trustee Michele Oka Doner received the Lifetime Achievement Award. Creative Spirit Awards were given to Anita Durst, founder and artistic director of Chashama, an organization that connects artists with vacant real estate; Audrey Smaltz, founder and CEO of Ground Crew, a fashion show and event production company; and Andrea L. Taylor, director of citizenship and public affairs for North America, Microsoft Corporation. Alumni Office Creates Regional Networks around the World The Office of Alumni Relations is establishing regional networks that empower alumni, parents, and friends of Pratt to nurture a lifelong relationship with one another and the Institute through events and programming. Networks are already forming in Washington, D.C., Boston, Philadelphia, and Roxbury, Connecticut, where more than 40 alumni and friends from the classes of 1958 through 2013 attended a regional network event at the home of alumna Elizabeth Lacy (B. Arch. ’84). For a schedule of upcoming regional events and information on how to become involved, visit alumni.pratt.edu. Students Collaborate with Lipton Iced Tea Pratt teamed up with Lipton Iced Tea to bring 24 hours of “sunlight” to New York City on June 20 in celebration of the summer solstice. Led by Eric O’Toole, adjunct assistant professor, Graduate Communications Design, a select group of multidisciplinary students designed and created a giant, luminous orb that conceptualized the “taste of summer” and the grandeur of the warm season. Constructed in just two short weeks, the Lipton Orb installation was unveiled last June at Lipton’s Summer Tastes Party at Beekman Beer Garden Beach Club at the South Street Seaport in Manhattan. It will be permanently installed on the corporate campus of parent company Unilever in New Jersey. The students—a mix of undergraduates and graduates from Industrial Design, Communications Design, and Fine Arts—created and built every aspect of the orb, from the internal frame to the face-mounted LED lighting grid. Celebrating 20 Years On Monday, November 11, 2013, at its annual Legends gala, Pratt Institute dedicated the Thomas F. and Tess L. Schutte Endowed Scholarship Fund in recognition of Schutte’s 20 years of visionary leadership at Pratt and his commitment to the creative successes of its students. Since becoming President of Pratt in 1993, Schutte has transformed nearly every aspect of the Institute—from the physical campus to the quality of the faculty—and converted Pratt into a residential college that attracts students from around the world. He has also led the revitalization of the surrounding Clinton Hill neighborhood and helped turn Myrtle Avenue into a thriving commercial strip that serves both the local and the Pratt community. To highlight some of Schutte’s achievements over the past 20 years, here is a snapshot of Pratt then—and now. All HVAC Service Co., Inc.
Martin County Community Foundation, Inc.
Mojo Stumer Associates Architects, P.C. Guy Conti Art & Design, Inc.
Evan Akselrad Alarmingly Affordable, Inc.
General William Mayer Foundation, Inc.
Diane Pickering James Pickrel & Carolyn Woolley Leighton Pierce Mary S. Porter '72 & Brent Porter Arin A. Prisand Rekha-Leigh Punch Robert K. & Evelyn D. Pederson Family Foundation Robert Zaccone & Associates, P.C. Arthur Sackler & Elizabeth A. Sackler Juris Sarins '73 & JoDean Sarins Save A Sample! Corp. Alan Schwartzman '75 & Ruth Schwartzman* RitaSue Siegel '61 Stephen Sills Irene Treiber Urban Outfitters Mark Weber, P '12 Betsy Weis & Ron Weis Brendan R. Whalen '94 & Karen Glasbow Marion S. Wollmeringer Brian H. Wood '01 Constance Wright & David Stoldt Mary L. Young & Steven Young Jon R. Zogg '68 Bernard Zyscovich '71 Pratt Institute would like to thank its donors who have made gifts of up to $499, whose names are listed on our website. Please visit www.pratt.edu/honor_roll to view the complete list of donors. Cypress Hills Local Development Corporation D. Douglas Virtue, Ltd.
David Kleinberg Design Associates, Inc.
Kum Kau Chinese Kitchen, Inc.
Laura Bohn Design Associates Inc.
Harley House Design Group Corp.
CondĂŠ Nast Publications, Inc.* Conservation Services Group, Inc. Hybrid Product Design & Development, Inc.
ING International Flavors & Fragrances, Inc. Planned Parenthood of NYC, Inc.
Pratt Institute would like to recognize the following estates and trusts from which the Institute received distributions in Fiscal Year 2013. Robert Zaccone & Associates, P.C. In memory of Gloria Dinerman Dorothea J. Coiffe '04 & Sing Chin In memory of Robert Djerejian HLW International LLP Lettie A. McDonald & Ralph McDonald In memory of James R. Doman Jr.
Jenny J. Lee & David White Esq. Rebecca C. Winters '04 Caroline H. Woodward '00 Blaikie Worth Yaryna Wynar '06 Thomas G. Yeaton '03 Mitchell Yee Ira W. Yellen '69 & Gail Tobin-Yellen Wilmer Zamora Gaviria '10 Robert D. Zera '74 Lewis Zurlo '58 Pratt Institute would like to acknowledge Larry Gagosian, Bruce M. Newman ’53, and Aby Rosen for their invaluable support of Flameproof, the thesis exhibition by Bachelor of Fine Arts students affected by the Main Building Fire. Matthew Tragesser Jolene Travis Anthony Tucker Jon W. Tucker Kate Ünver Stephen A. Valentine '77 Tanya H. Van Cott '93 & Bruce R. Hannah '63 Scott E. VanderVoort & Linda Stern Ellen S. Wallenstein '78 Joseph Weisbord '96 & Joyce Weisbord Compton Williams Robert M. Zaccone '71 & Paula Zaccone Marian C. Zacharow Karyn Zieve Marianthi Zikopoulos Carl Zimring Pratt Institute would like to thank the generous individuals who helped to secure gifts on its behalf. Creating a legacy like Pratt’s takes time. start yours today with a 2013 charitable ira rollover—and skip the tax on your required distribution. if you are age 70½ or older in 2013, you can make a gift to the pratt program of your choice by transferring up to $100,000 directly from your ira to the institute. the gift will count toward your yearly, required minimum distribution, and you’ll owe no federal income taxes on the portion you donate to pratt. this provision is only valid until December 31, 2013, so don’t delay. act now before it’s too late. â&#x20AC;&#x2DC;Tis the season. Get creative. This holiday season, visit gateway.pratt.edu for gift ideas and products by Pratt graduates like Charles Churchward (B.F.A. â&#x20AC;&#x2122;71).